Enjoy great Polk sound at pocket-friendly price! The ear-pleasing, surprisingly affordable R20 speaker teams a 3/4" Dynamic BalanceÂ® tweeter and a 6-1/2" Dynamic Balance woofer in a ported enclosure. Highs are crisp, mids are full, and lows are rich! Plus, at a mere 12-1/2" high, this unobtrusive bookshelf speaker will fit into almost any room discreetly. The keyhole slot makes for nearly effortless wall-mounting. Muddled but deep bass given the woofer size. Tweeter is ok but needs more help because it lacks any body/fullness. Sound is a little too flat. Parts Express has M&K/Vifa tweeters for less than $10 that will make these sound much better thoughout the highs and part of the midrange (can't beat that). If you want to go further, add a Dayton 2-way crossover for another $20 or so each (tighter bass response and fuller sound) and these speakers will sound like speakers $2500-$300 dollars more per pair. OK, but for a little more money, use the cabinets (with very minor modification) to make these spoeakers sing. I picked up a pair of these on Craigslist and was never sorry I did. It was a steal at $20. To me, I like the Infinity RS2's just a bit better, but these are real close. These polks may give a bit more bass but I think the Infinity mids are better. I have them in use in a bedroom without a sub. They would make nice surround speakers or use by themselves in a small room. Another sleeper is the Insignia bookshelfs (61/2" woofer, lower cost). A good buy for the money. Not quite as good as these Polks though. I think most would like these a lot better than Sony, Onkyo, and Pioneer speakers. If your getting your kids started in audio equipment, I recommend these. They will fit almost anywhere. Similar products used: Sony bookshelfs, Infinity RS1, RS2, Insignia bookshelf. Infinity RS4, RS5 towers. A great budget bookshelf. The bass is a little lean (which is to be expected given the small size), but the midbass is pretty tight and articulate. It matches well with a subwoofer that can compensate for a lack of low bass. The mids have a slight veil to them, but otherwise sound quite natural. The highs are detailed and not overly bright. However, I wouldn't classify the highs as being all that smooth either. The imaging is fine and soundstage is surprisingly wide. Quality of construction is also very good at this price point. Overall, these are definitely a cut above other cheap bookshelfs (sony, pioneer, etc. ), but the veiled midrange and somewhat artificial sounding highs remind you that it still isn't high end either. Given its price point, there aren't many speakers that can beat the R20 (perhaps athena, mission, paradigm, etc). MY BROTHER BOUGHT THE SPEAKERS, FOR THE PRICE PAID(ALL THE ELECTRONICS ARE VERY EXPENSIVE AT MEXICO), IS A GOOD BUY, YOU CANT EXPECT NOTHING EXTRAORDINARY FROM A SPEAKER THAT COST LESS THAN 200 BUCKS, BUT TO BE HONEST THE SPEAKERS SOUNDS RIGHT, WITH A WELL DEFINED BASS ,GOOD HIGHS AND REASONABLE MID (A LITTLE MUDDY) , IF YOU CAN COMPARED THEM WITH A B&W 300 SERIES GO FOR THE 300`S BUT THEY COST 120 DLLS MORE . 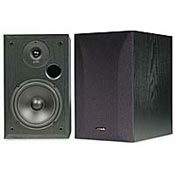 FOR SURROUND MODE THEY ARE GREAT ,FOR STEREO SPEAKERS THEY SOUND JUST RIGHT. Punchy and powerfull bass, crispy high for silk dome. These are very good sounding speakers.The bass is tight and the highs are crystal clear.It has an airy sort of muffled sound but nothing is over exaggerated.When listening to these speakers you may find that they sound best with the bass and treble set on flat and let your subwoofer do the rest.Once you get them broken in you"ll realize they are excellent speakers and that Mr.Polk knows how to make great speakers.